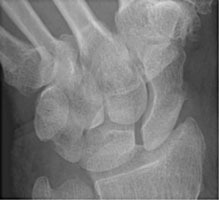 Scaphoid fractures are the most common carpal fractures, resulting from a fall on an outstretched hand. 70 % of these occur at the waist, 20 % at the proximal pole, and 10 % at the distal pole. Blood supply for the proximal pole enters at the waist. If this blood supply is interrupted due to fracture, the proximal pole is at risk for avascular necrosis. Special scaphoid views with the hand in ulnar deviation may be needed to detect these fractures. 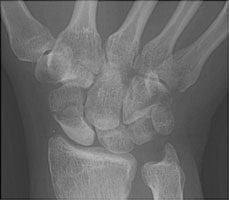 A PA radiograph of the wrist with scaphoid deviation. 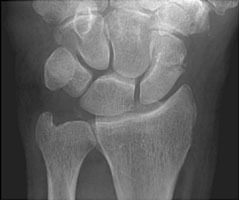 This view shows a fracture of the waist of the scaphoid bone. B PA radiograph of the wrist. This demonstrates a scaphoid waist fracture. C PA radiograph of the wrist. Another patient shows the proximal pole to be dense and has undergone avascular necrosis. This is a known complication of waist fractures.